A day and a half in Dresden, surely more than enough time to see everything the city has to offer #eventprofs? Well, not by a long shot. This fantastic city is an absolute gem, bursting with unique event spaces and more traditional meeting rooms. 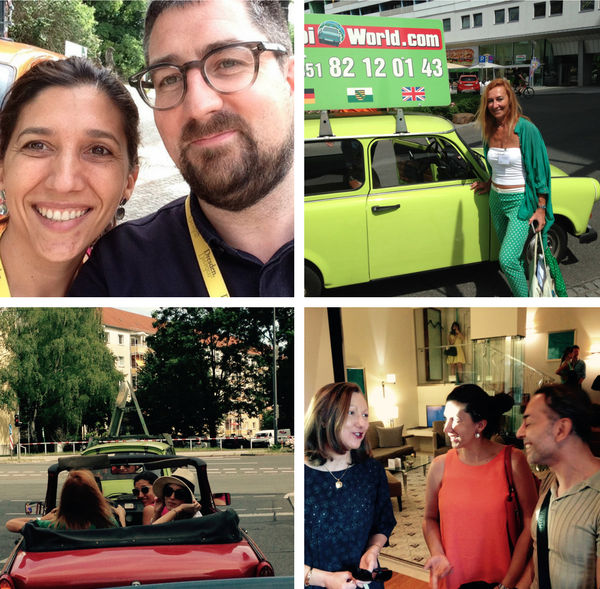 Over the last 36 hrs a little group of eventprofs have been discovering Dresden. We are a mixed bunch, including event planners from Mexico, Italy, Belgium, the Netherlands, Spain and the UK. We all have our very different events to plan. But already we have reached a consensus: Dresden has something for us all. This relatively small city, (500,000 population) by German standards, packs a punch as strong as a German Beer. We’ve left Dresden to take a short but exceptionally worthwhile detour to the Saxon Wine region. We have somehow managed to have time for a wine tasting at the beautiful Schloss Wackerbarth winery – sandwiched in between a tour of the grounds and a tour of the meeting space. We have still got to work of course. Briefly, looking back over the last day and a half, it is fair to say that we have all been more than “pleasantly surprised” by Dresden. A city of bridges, gardens and stunning (mostly restored to former glories) architecture. The City seems to weave the gold thread of its meeting spaces into the most beautiful of tapestries. Besides meetings. A half day could be spent, just wondering the old town. Half a day just sampling some of the beers, in the many bars in the super trendy New Town. Spending a late evening hour or so, strolling along the river would be an amazing afternoon. But we #Eventprofs had venues to see! On our little familiarisation trip we’ve seen ten great meeting spaces. So different in so many ways, however, with time to breath, I have found three keys to Dresden’s appeal. These three gold threads, connect all these wonderful venues. Each venue seems to be, in itself, a small version of Dresden. They all have natural light and cracking views, and loads of space. Even the smaller rooms, seem larger, as light crashes in from each high window. Some of the venues have been built within the shell of a building. Hotels have appeared from the inside of warehouses. Unique event spaces transformed from animal pens and slaughterhouses. These traditional spaces sit next to modern constructions of glass and steel. Dresden has kept its core, while reenergising its facade. In almost all of the venues we visited we were transfixed on the beautiful art on display. We’ve seen art with a grubby past; the profession of “Artist” used as a cover by a German spy. We’ve seen original Barock pieces, appearing almost Biblical, as they proudly and determinedly stand on display, despite the knocks of past epic floods and raging fires. As we head further West, to discover Leipzig, we are all forming, what will become our lasting memories of Dresden. By writing this post, my view is fixed. That light, bright, spacious, arty city, both modern and traditional is the most perfect place for almost any kind of event. 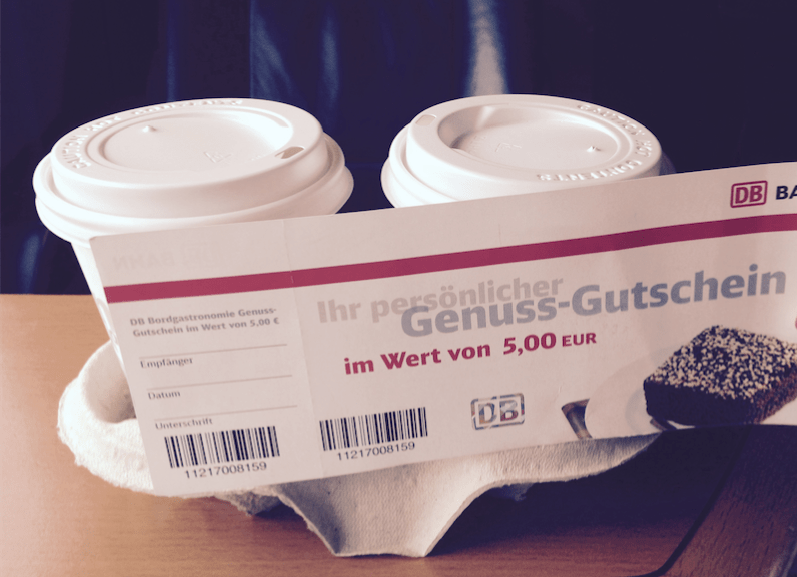 Wonderful Little Gift from DB Bahn. A €5 Voucher. Much needed Coffees. Would be great to meet you again here in our city. Maybe @ MESSE DRESDEN!